Seventy four years after Edison set up – and Fred Gaisberg worked for – the company that became Columbia Records a young American artist was working at one of the company’s recording studios; Columbia Studio A on 799 Seventh Avenue near 52nd Street in New York City. He was making a record that would become one of the landmark recordings. 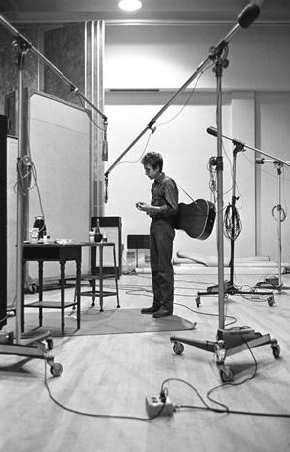 He was Bob Dylan – and the sessions being interrupted for this publicity shot – were The Times They Are A Changing Bob Dylan was seventy this week. Happy Birthday, Bob, from SoundOfTheHound. You can buy a print of the Bob Dylan picture from the Morrison Hotel Gallery.